Preheat oven to 350°F. Grease two 9-inch round cake pans and line the bottom with parchment paper, then grease the top of the paper. Or, grease and flour the bottom and sides of both pans. I prefer to use the non-stick baking spray that has the flour in it for easy removal. In a small bowl, combine the crushed pineapple with juice and the golden raisins and set aside. In a large bowl, combine eggs, buttermilk, oil, sugar and vanilla and mix well. Add in the flour, baking soda, salt, cinnamon, ginger and nutmeg. Mix just until blended. Stir in the carrots, coconut, crushed pineapple and raisins with juice and the chopped walnuts. Mix until just blended together. Pour into the prepared 9-inch cake rounds. Bake for 35 minutes or until a toothpick inserted into the center of the cake comes out clean. Meanwhile, in a large bowl, beat the butter and cream cheese until nice and fluffy. Add in the vanilla, orange juice, orange zest and sifted powdered sugar. Beat until smooth. If it is too thin, add in some powdered sugar or additional orange juice if too thick. When the cake layers are completely cool, you can level the cake using this handy little inexpensive cake leveler cutter, then frost the top of one cake layer and place the other cake layer on top. Decoratively swirl the top of the cake with the remaining frosting, leaving the sides unfrosted. Scatter walnuts on top, if desired. 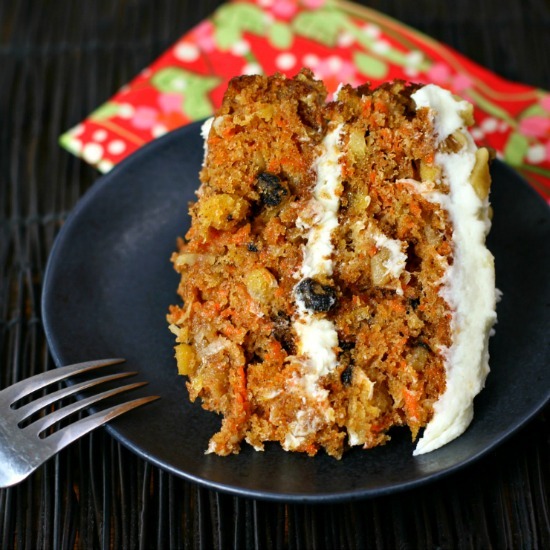 You are going to love this incredibly soft, light and moist Carrot Cake with its ultra-creamy orange zest cream cheese frosting! 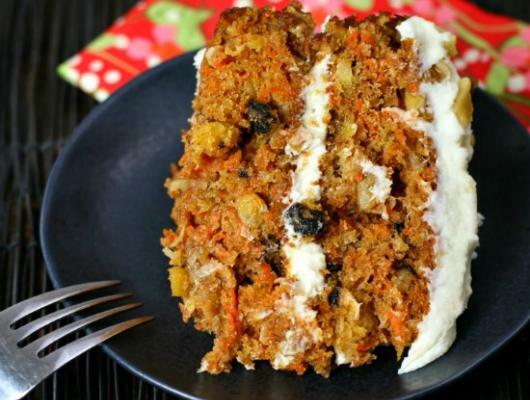 It truly is the Best-Ever Carrot Cake recipe that your family and friends will love!